In her one hour and thirty minutes State of the Province Address (SOPA) yesterday, October 8 at the Aurelio Gym here, Gov. Jade B. Ecleo shared her story a year ago when she left Manila to accept the mandate given to her by the Dinagatnons to lead them to a better future. "Our story is about obstacles hurdled, fears overcome, weaknesses converted into strengths, and confusion cleared by a common direction. It is a story of faith, and confusion cleared by a common direction. It is a story of faith, courage, commitment, and partnership. A story of people helping each other to transform current adversities to windows of opportunities." She further added that with the birth of the youngest province of the country, the expectations of the people were mountain high. "But instead of cowering from fear of not able to deliver it, we dissected these expectations, set parameters, and placed the parts within a time frame. We built hopes and encourage community participation. We purposively placed key stakeholders on board, and created our vision." Gov. Ecleo revealed in her that she speech envisioned the province as a progressive island-province with empowered communities living in the spirit of bayanihan (communal unity) geared towards agri-fishery, responsible mining and tourism, sustaining a balanced human ecology. "It is therefore our mission to promote socio-economic growth through sound governance and sustainable development of all resources," she added. 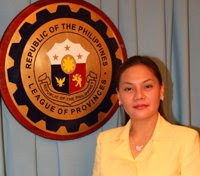 The Honorable Governor also committed to continually improve and spur innovations in the programs, strategies and experiences in infrastructure development, administration, and governance which proved to be relevant to the people's needs and are deemed successful and effective public service, fiscal improvements, economic growth, poverty reduction and social upliftment and like stone blocks, it helps build the foundation of the future of Dinagat Islands. Though, Gov. Jade proudly declared the provincial outputs and outcomes of the year passed, she could not help but thanked everyone who made these possible for without them things could have been different. Expressing her deep gratitude to her mom, Rep. Glenda Ecleo, "nga pinaagi sa iyang paningkamot nahimugso ang usa ka probinsya nga dugay na gipangandoy sa mga Dinagatnon isip katumanan sa mga damgo sa atong amahan na si Divine Master Ruben Edera Ecleo, Sr.; to my ever supportive brother, our Supreme President Ruben Buray Ecleo, Jr. together with the officials and members of the PBMA." Lastly, Gov. Ecleo thanked the men and women of the Provincial Government and component local government units for the support and cooperation.